The ENCODE data comes out, and luckily they provide both .bam file and .bigwig file. Thus, it occurs to me that I want to give a try to reproduce the data visualization with tool: BEDtools and other related tools. From the image, we will find my-version-data and official-version-data roughly share the same peaks, however, my-version-peaks are somehow masked by certain uniform noises. And it drives me crazy. Note that I know not all the bioinformatics works can be reproduces, but this issue dose not get involved with much algorithms, decisions, etc. Therefore, it's supposed to be reproducible, I think. bigwig Reverse signal file ready for uploading to UCSC. I refer to the standard manual of BEDtools, I'll use forward strand as example, and the reverse strand signal is generated in the same way. Note that I've used -strand flag to separate the two strands. Upload to ftp and finally to UCSC genome browser. I was wondering which filtering step I've missed. I've checked whether all the reads in the .bam file are unique mapped. 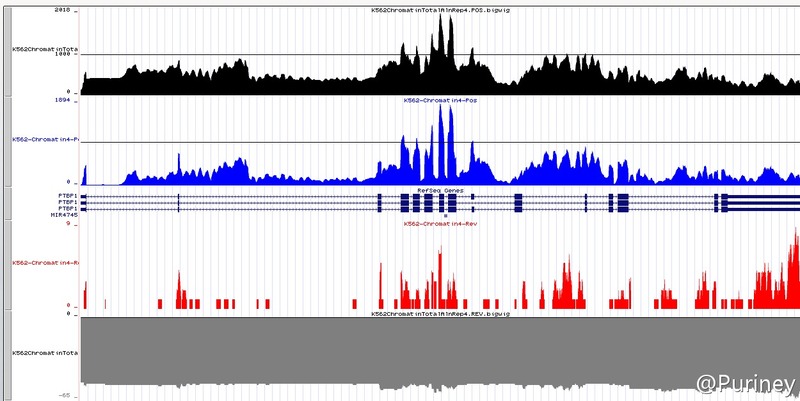 As the reads are mapped to genome with a tool named, STAR.. According to the manual and common sense, the mapping quality in .sam file equaling 255 means unique mapped reads. Thus, all the reads in the .bam file are unique mapped after I've check the mapping quality. Welcome to BioStar. This is a great post. Well organized and formatted with step-by-step descriptions of what you did, what the problem is, and how you are currently thinking about the solution. Kudos for answering your own question and providing the update here! The green one is the POSitive strand signal, and it's exactly the same as the official version. The key is to add the -split option when one runs the genomeCoverageBed command. Treat “split” BAM or BED12 entries as distinct BED intervals when computing coverage. For BAM files, this uses the CIGAR "N" and "D" operations to infer the blocks for computing coverage. For BED12 files, this uses the BlockCount, BlockStarts, and BlockEnds fields (i.e., columns 10,11,12). With the -split option genomeCoverageBed calculates coverage using the interval of exon1 and exon2 separately and does not add coverage within the introns. Thanks for your comments. And yes, exactly. The uniform noise is resulted by the missing -split flag. I mistook genomeCoverageBed will omit all the intron reads. I added -split because I think genomeCoverageBed and coverageBed are twins. I knew coverageBed will not omit thus I give it a try when I'm later running genomeCoverageBed. Then, everything goes well. Hg19 Strand Information Of Sam Output. 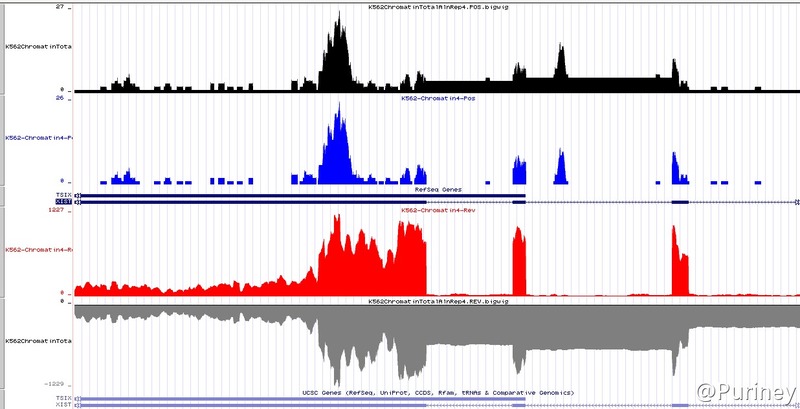 How Would One Correlate A Wig/Bedgraph File With A Bigwig File?